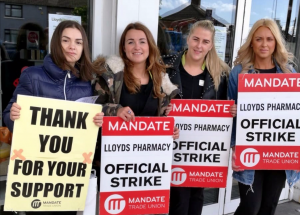 TWO years ago Mandate had virtually no members working in Lloyds Pharmacy Ireland and the workers’ conditions of employment reflected that. Many Lloyds workers were on zero-hour contracts; had no sick pay scheme (it was stolen from them in 2007); earned the National Minimum Wage (€9.55) after 5-10 years experience; had no incremental pay scales and were only afforded statutory annual leave entitlements (20 days per year). However, the short but inspiring journey they took changed all that with workers winning four days sick pay per year; up to two days extra annual leave per year; the implementation of secure hour contracts and incomes; and importantly, pay increases of up to 34% with pay scales. How did they do it? They joined their trade union and took action. In 2016 a small number of Lloyds Pharmacy workers approached Mandate asking for some advice and representation. They were aggrieved at how they were being treated. A small number of workers then set about organising their colleagues into Mandate, highlighting the potential for improvements in conditions of employment. For instance, Boots Ireland workers, who have enjoyed trade union representation for decades, enjoy far superior rates of pay and conditions of employment to their own. After four years, a Boots Customer Assistant earns €13.50, while a Lloyds Pharmacy Customer Assistant could be earning €9.55 – a 41% difference. Lloyds Pharmacy is owned by the world’s largest pharmaceutical firm, McKesson Corporation. The company has three times more revenue than the entire Irish State and was easily in a position to pay more, they simply chose not to. And without workers being members of a trade union, there was very little they could do about it. Their CEO, John Hammergren, earned $18,143,017 (€16,146,856) in 2018, while his Irish workforce was subjected to zero-hour contracts on the minimum wage. For context, it would take a Lloyds Pharmacy worker receiving 40 hours per week 812 years to earn what their CEO earned in one year. These levels of inequality are growing all across the world, particularly in the retail and pharmaceutical sectors, and there really is only one way to address it, through active and democratic trade unions. 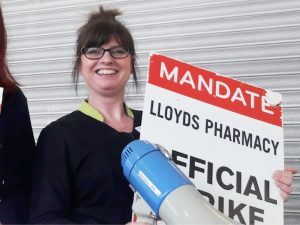 When the Lloyds Pharmacy workers started to organise, the company, recognised the threat to their substantial profits and exorbitant executive pay. They tried everything they could to prevent unionisation. Mandate wrote to the company in February 2017 seeking a meeting, and immediately management set out to deny their workers an effective voice at work. They set up an internal ‘yellow union’ called the CRC. Members of the CRC were not democratically elected, as they would be in a trade union, but were instead hand-picked by management. The CRC, in tandem with management, made a proposal on May 4th in an attempt to buy the workers off. The proposal contained a pay increase of 2.5% for all on pay rates of €10.60 per hour or above, and for those on the minimum wage (€9.55 per hour) an increase to €10.60 per hour – an 11% increase. It also included four sick days per year. The buy-off didn’t work. By May 2018, 200 Lloyds Pharmacy workers had joined Mandate. They wanted their democratic and human right to be represented by a trade union of their choice, but unfortunately, Ireland, as an outlier in the EU, has no legislation to vindicate that right, and so they were forced to take industrial action. On June 7th, the workers balloted for industrial action by a landslide 92% in favour. There were now almost 280 Lloyds workers who had joined their union in almost 40 stores. Lloyds management, rather than allowing their workers their right to representation engaged in an expensive union-busting campaign which inconvenienced customers, irritated their workforce and damaged the business brand. All because they believe the breaking of workers in a union is a short-term investment for long-term gain. The workers engaged in their first ever bout of industrial action on Thursday, 14th June, 2019. 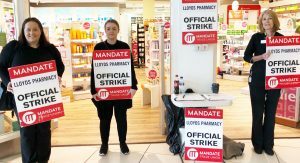 In the best interests of their customers, many of whom depend on life-saving medication from the pharmacy, the workers decided a one-hour stoppage would suffice, in the hope that management would put their customers and staff first. They didn’t. The workers had scheduled a two-hour stoppage the following week, and a three-hour stoppage the week after, with the hope they wouldn’t have to engage in any of them. Regrettably, they did have to. After three days, management continued their intransigent attitude, refusing to engage with the workers’ union, and instead continuing the pretence of negotiating with the management-influenced CRC (Lloyds Pharmacy admitted to the Labour Court that they funded the CRC). The workers were forced to escalate the dispute to full days of industrial action, with a total of 10 days completed, management had to up their game. Despite stating,“The above agreed terms on pay will be for 12 months from April 1st 2018 to March 31st 2019” in their proposal only weeks previous, the company offered another pay increase. This time it included pay scales. A clear sign that being in a union and taking action pays. Amy Bannon, who works as a Dispensary Technician in the Nutgrove store went from €11.57 per hour to €15.50 per hour in a couple of months, but emphasised that this wasn’t down to a sudden urge of generosity from her employer. “It wasn’t easy, but we stood together in stores all across Dublin and in other parts of the country, and we won. Had we not joined our union and taken action, I would now be earning €8,174 less per year and I wouldn’t have a sick pay scheme. Lloyds Pharmacy spent months explaining to staff that they would have done all this without Mandate’s intervention, but that argument only appeals to management and to those who are extremely naïve. Management constantly contradicted themselves, telling workers they couldn’t afford pay increases, before relenting and paying substantial pay increases – not once, but twice. They went further in their anti-union campaign by spending a fortune on advertisements in national newspapers, spreading mistruths about the strike, before eventually offering a voluntary severance package with generous terms of redundancy – costing millions of euros. This, we believe, was really about removing union activists from the business so they wouldn’t have to deal with Mandate in 2019. More than 60 members took the package, but the other 200 remain, and we are now preparing to go again. The Lloyds Pharmacy workers didn’t get everything they wanted, but they certainly improved their lot. On the 25th September, they voted by a margin of 75% in favour of temporarily suspending industrial action and pursuing the company through the Labour Court, with a date for a hearing set for Friday, 26th April 2019. They still do not have the right to collective representation, and this is an indictment on successive Irish governments. They have facilitated this type of union-busting practice, which means the only way workers can avail of their internationally recognised human right to trade union representation is by striking and losing out on pay for doing so. But when you’re up against the largest pharmaceutical company on the planet with vast resources, the odds are firmly stacked against you. Mandate, in the coming weeks and months, will be working with other trade unions in Ireland to seek legislative changes that make it easier for workers to join trade unions, make it easier for them to take industrial action and also strenghten workers’ rights to representation. Watch this space. In the meantime, if you want a pay increase or improvements in your conditions of employment, do what the Lloyds Pharmacy workers did. Join your trade union and get active in it. You can join Mandate by clicking here, or if you’d like to contact Mandate about setting up a union in your employment, email babom@mandate.ie.